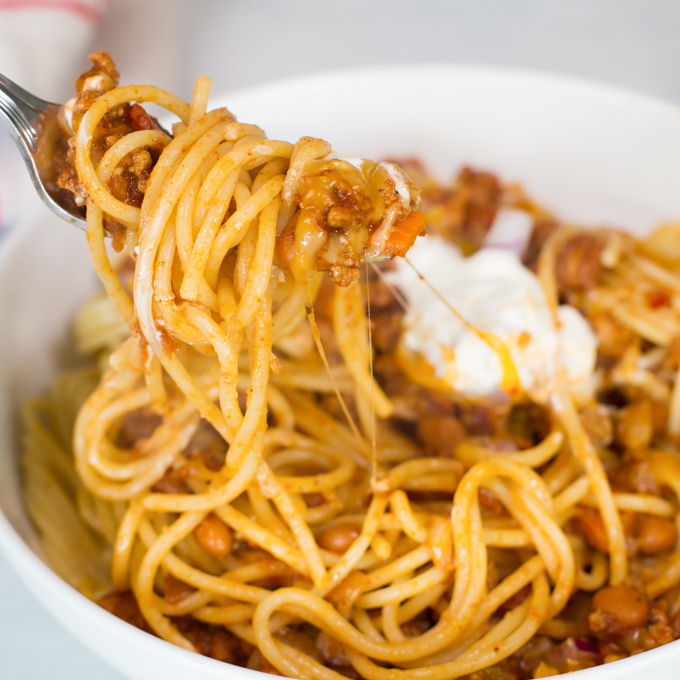 When I first started as a food blogger, I thought my most popular posts were going to be anything “low fat” and “healthy.” It’s not that those aren’t popular, but my most popular recipes have been easy to prepare comfort food. 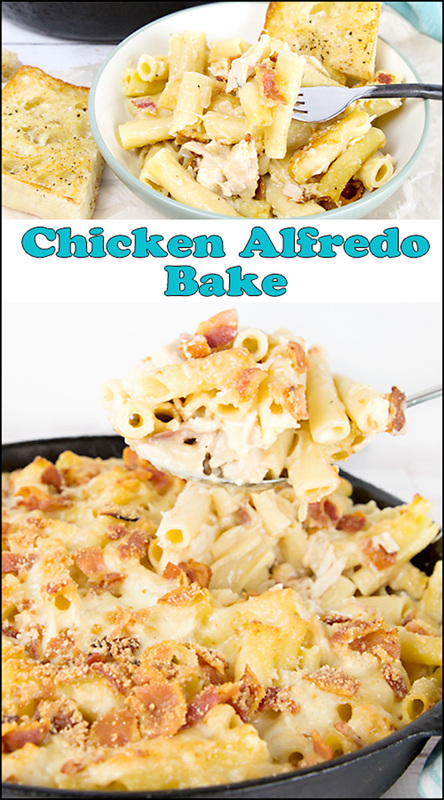 This Chicken Alfredo Bake is exactly that! 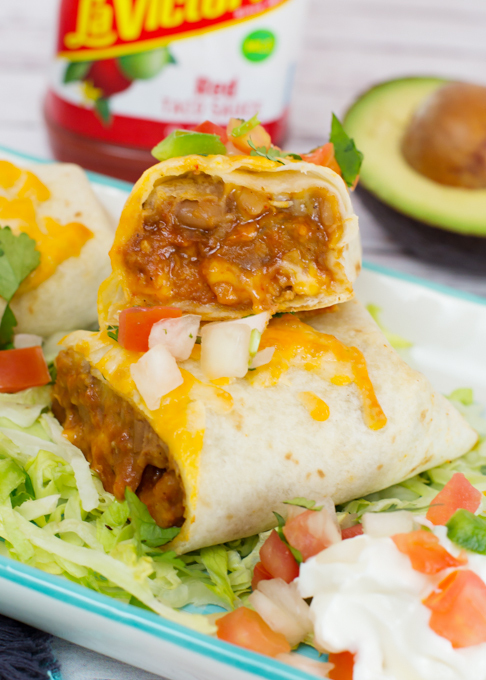 It’s simple to prepare, making it the perfect meal for busy families. You’re probably thinking that “alfredo” sauce is too heavy and creamy, and typically it is. But this is a lightened up version, made with chicken broth and non or low-fat milk. No heavy cream is allowed in this recipe. I know, I know, there is added cheese, but at least it’s not cheese and heavy cream. 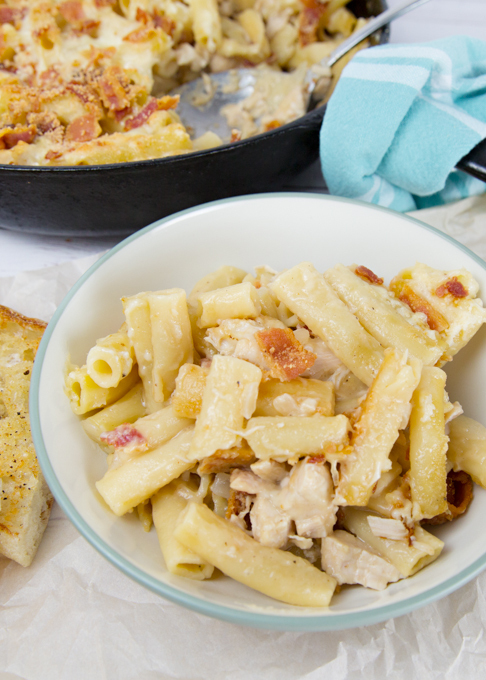 Guaranteed you aren’t going to miss the full fat version in this tasty Chicken Alfredo Bake. 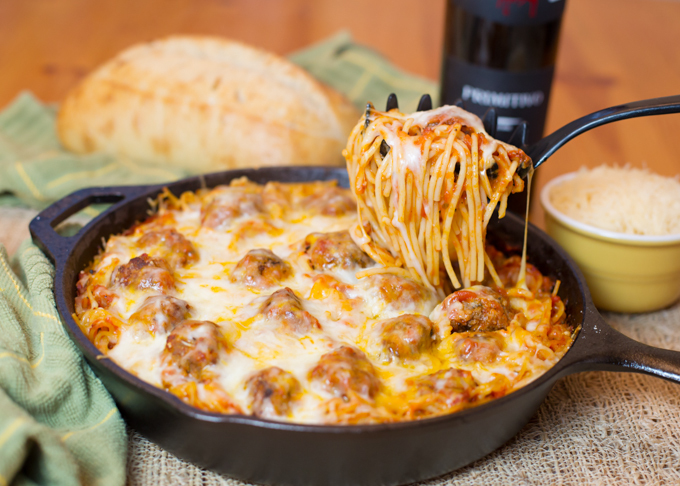 I just love cooking in my cast iron skillet, there’s just something so comforting and rustic about cooking and serving from the same pan. And, with the exception of cooking the pasta in a separate pot, this was a one pan meal. You’ve got to love that! Above is right before going into the oven, below is straight out of the oven and steamy hot! You see the little crispy edges below, those were my favorite bites! 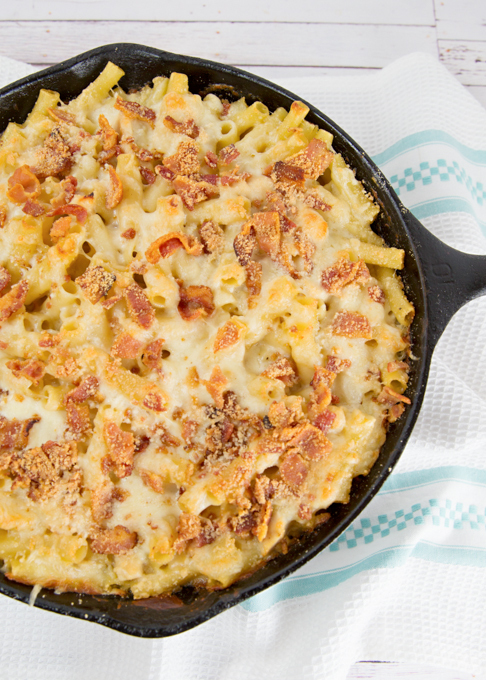 The crispy bacon and salty parmesan made the perfect topping for this “comfort food” meal. A little side salad and some toasty garlic bread and dinner is served! Cook pasta "al-dente" according to package directions. Drain and set aside. (try to time so pasta is finished when sauce is finished). Cube or shred chicken and set aside. 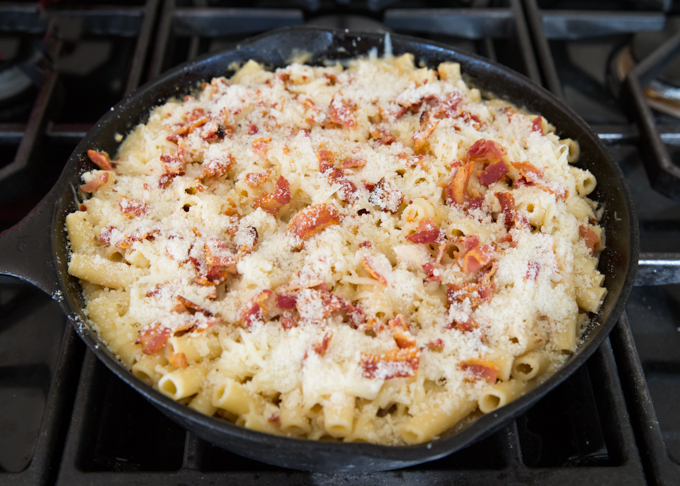 In large cast iron skillet (or any oven proof skillet), over med/high heat cook bacon until crispy. Remove and set aside. If needed drain excess grease from pan (a little is ok). Reduce heat to medium, add olive oil and chopped onion, cooking 2-3 minutes. Add garlic and cook until onion is translucent and tender. Add flour to pan, stir to combine with onion mixture and cook for 1-2 minutes. Add chicken broth and whisk until smooth. Add in milk and again whisk until smooth. Cook, whisking regularly until sauce begins to thicken. Gently add in cooked pasta and cubed chicken, lightly stirring to combine. 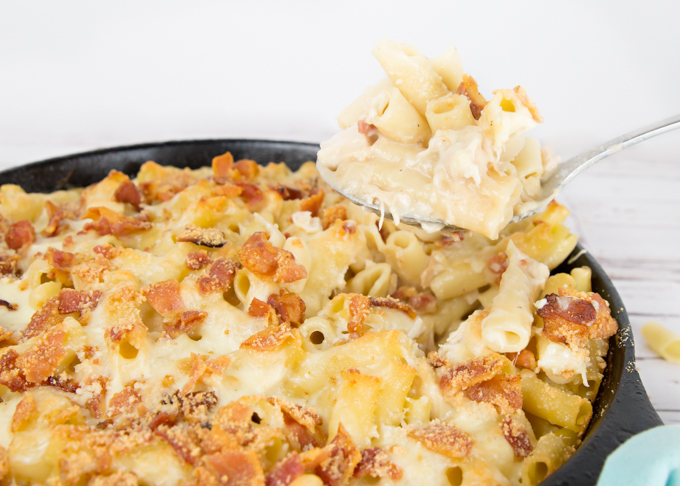 Top with grated jack cheese, ½ cup parmesan cheese, and bacon crumbles. Cook in preheated 375* oven for 20-30 minutes or until bubbly hot, golden, and the edges just begin to crisp. 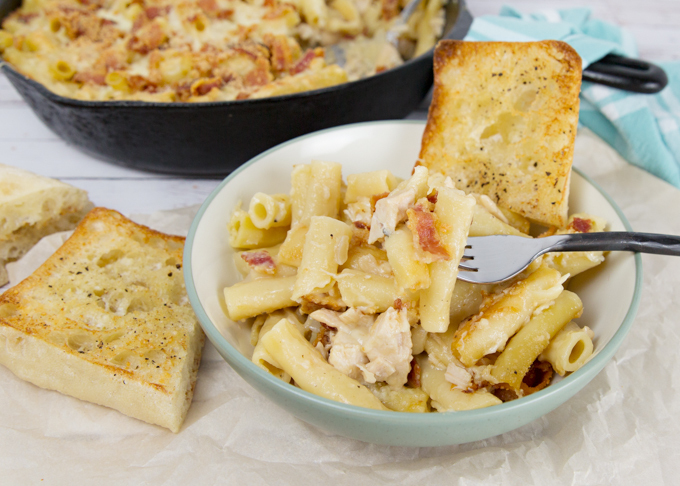 This recipe has been adapted from Gimme Some Oven’s Chicken Alfredo Baked Ziti. Make sure and check out her site, it’s full of delicious recipes! Yum! Looks delicious! 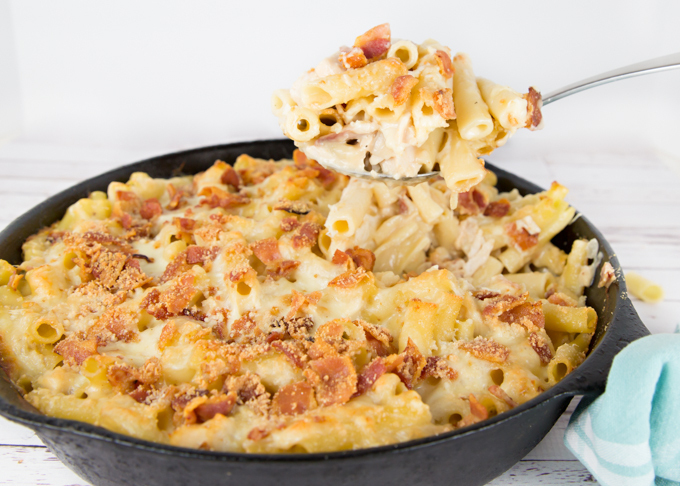 That is definitely a comfort food that will do no harm 🙂 thanks for the recipe! Why does this dish look SO DRY when served. It looked so good in the dish and then unbelievably dry dished up. Hi Audrey, Actually we loved it as it was, but you can certainly use a little less pasta or add some extra sauce to suit your family’s taste (I just happen to have a husband that doesn’t like a lot of extra cream sauce in dishes).